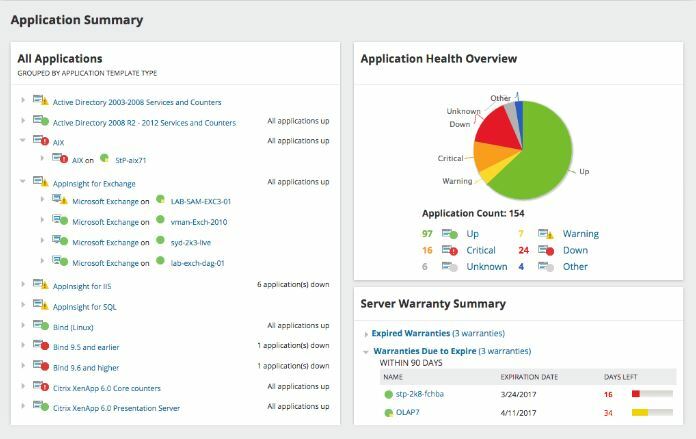 This is the ultimate review of SolarWinds Server & Application Monitor also referred to as SolarWinds SAM. This is NOT just some lame Top 10 list. Instead, you’re going to see real test results. 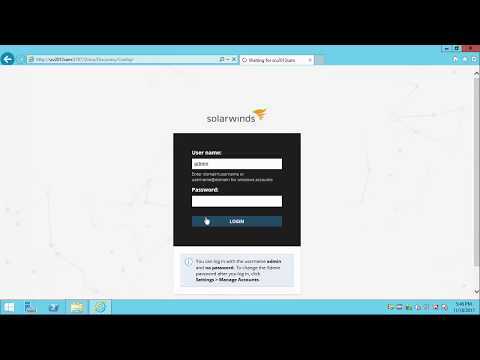 Watch me install, configure and put SolarWinds SAM to the test. 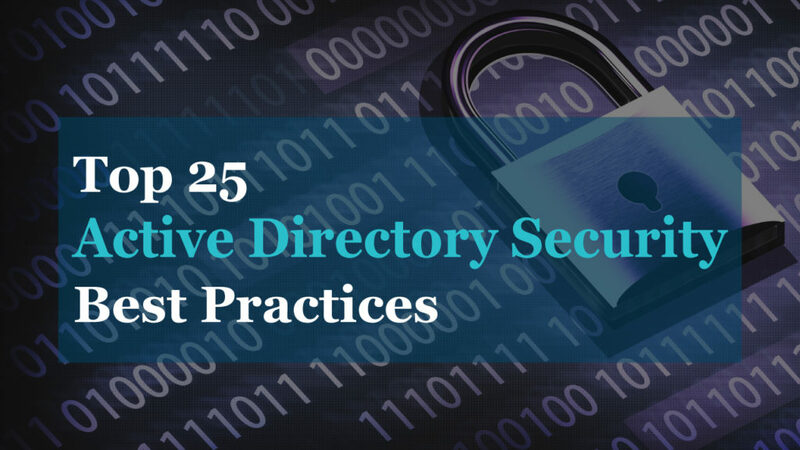 If you’re looking to monitor Active Directory, Windows Servers, DNS, or custom applications, then you’ll want to check this review out. You can download a free trial of SolarWinds SAM and follow along with this review. I have videos below that walk through the install and configuration. If you have questions or need assistance just post in the comments at the bottom of this review. How does SolarWinds SAM help IT Administrators? SolarWinds Sam provides in depth monitoring of servers (physical and virtual) and critical applications such as Active Directory, DNS, and DHCP. Out of the box, SAM provides monitoring support for over 200 applications and the ability to create custom monitors to support any application or server. It also provides customized alerting and event triggers. 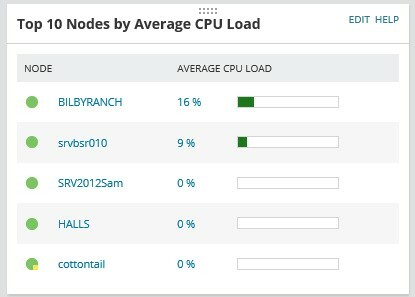 There are plenty of tools on the market that can provide basic monitoring of a server such as CPU, memory, disk space and availability, SolarWinds SAM goes way beyond the basics and provides deep insight to application and services. Proactive Alerting – Get email alerts when thresholds are hit such as, high CPU or memory usage. These alerts can be customized and emailed to specific individuals or groups. Increase efficiency and productivity – With a good monitoring solution in place, you can focus on other tasks making you more productive. Avoid downtime – You will be able to spot possible issues before it happens and avoid downtime to critical services. This will make the boss very happy. Speed up troubleshooting and resolve issues faster – With an easy to use interface you can troubleshoot and resolve issues faster. Quick access to detailed performance metrics – SolarWinds provides quick access and easy to understand metrics that the whole team can understand. 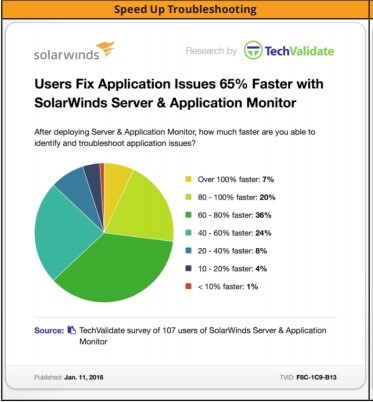 A recent study found that users fix server and application issues 65% faster with SolarWinds server and Application Monitor. I can vouch for that as I’ve been a long time user of SolarWinds. My team and I rely on these tools daily to monitor IT infrastructure. I’ve used them countless times to identify issues and find the root cause of performance problems. Later in this review, I share a real world story on how I saved BIG. You will be able to pinpoint issues and answer the question, is it the network or is it the application? How many times have you been told it’s the network or it’s a firewall issue? When in fact it was the application that was causing the performance issues. It’s nice to have the tools to back this up. Another great benefit is the ability to trigger actions based on events. For example, you have an unstable service that randomly stops working. Instead of manually monitoring and restarting it you can have SolarWinds monitor the service and trigger an event when it stops. This alone will save you many hours. This is just one example, you can basically configure any trigger (script) on any event. SAM is loaded with features! It’s hard to cover them all in a single review, here are some of the key features. Monitor key metrics on physical and virtual server such as: CPU, Memory and storage. 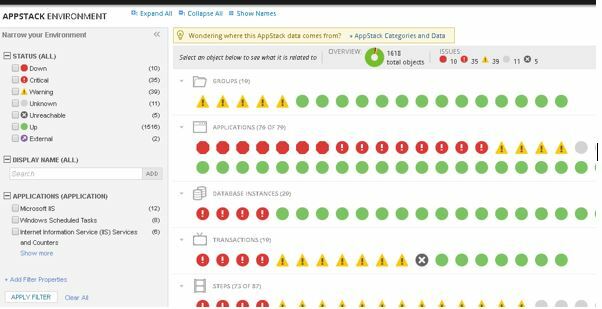 Identify the root cause of application problems with in depth monitoring. Monitor critical services such as Active Directory, DNS, DHCP, and Vmware & Hyper V.
Create custom templates to monitor any service, process or windows tasks. Monitor Hyper-V and Vmware ESX severs. Monitor packet loss, latency and interface utilization. Monitor processes, services, windows tasks and more. The AppStack is one of my favorite features of SolarWinds. 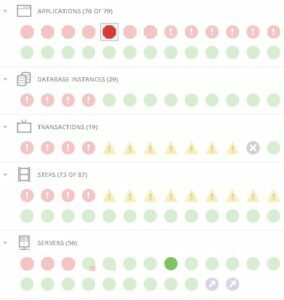 From one screen you can quickly spot any critical and potential issues with your servers, applications and storage in seconds. The AppStack view is a visual map that provides an indepth view of your entire environment. AppStack gathers detailed information from your monitored objects as well as their relationships with other objects and displays them in a single dashboard. For example, opening the AppStack page I can quickly see the status of multiple components across the entire environment. I can get more details by just hovering the mouse of any object. Once you click on an object, the dashboard will update its view to highlight only related objects. In this example, I clicked one of the applications that was in red. I can now hover over the server for details or double click it to open the server page. 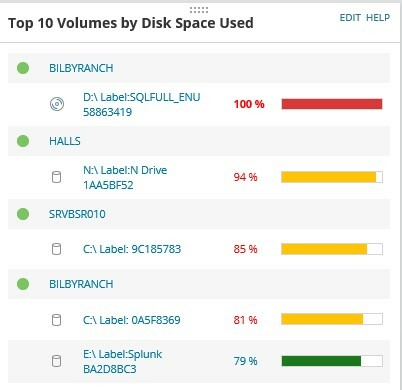 Top volumes by disk space. Bad things happen when a servers disk space fills up, I check this view frequently. I also setup email alerts when the disk is at 98% full. How does SolarWinds SAM work? 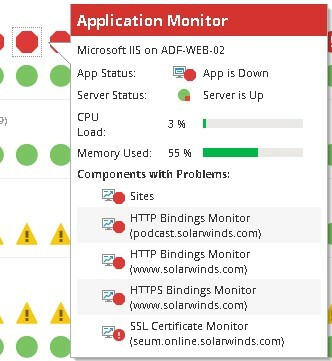 SolarWinds SAM provides two basic methods for monitoring, WMI and SNMP protocols. These are two industry standard protocols that have been used for years to poll and collect metrics from devices. With SolarWinds you can use agentless monitoring, this means you do not need to deploy agents or script to your devices to monitor them. An agent is offered for those that prefer one. There are pros and cons to either, you will have to research and determine which option is best for your environment. You can add nodes manually to be monitored or you can use the network discovery wizard and have it automatically find servers and application in your environment. To monitor applications SAM uses templates. A template is a collection of component monitors that are related to an application or service. 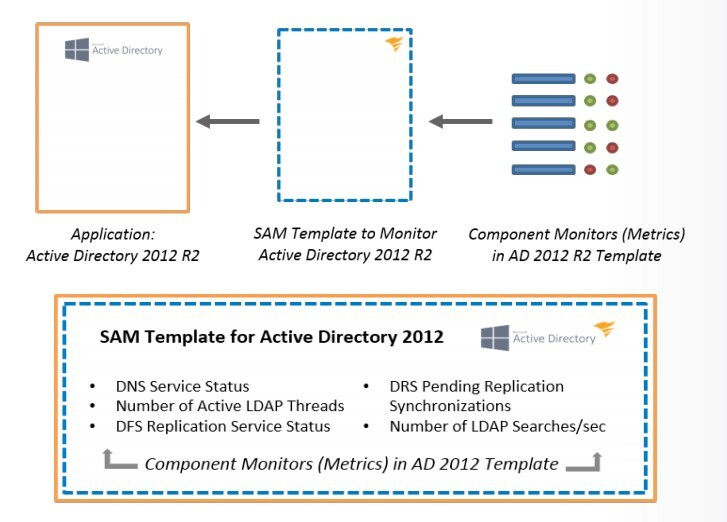 For example, to monitor Active Directory you would select the Active Directory template. This template will include components such as LDAP services, DNS, replication, login, directory read writes/sec, etc. You can also customize the templates to include additional polling information. If you cannot find a template you can easily create your own to monitor whatever you want. For example, I have a custom application that monitors a folder for xml files, it will then process the files and mark them as completed when it’s done. This is an in house built program so SolarWinds didn’t have a template for it, so I had to create my own. I just created a simple template to monitor the service and process that go with that custom built application. Now I can easily monitor it and be alerted if it goes down or doesn’t start on a server reboot. Using templates makes it simple to monitor multiple servers. You can download a FREE trial of SolarWinds SAM here and follow along with the videos below. 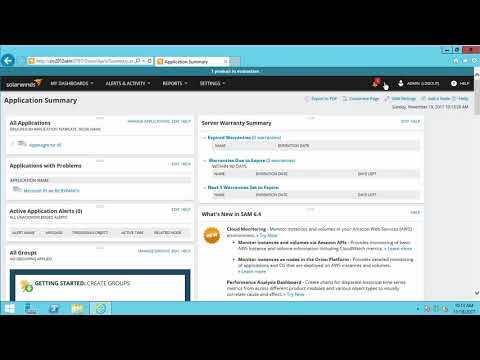 Installing SolarWinds SAM – In this video I walk through the installation of SAM. I used a VM running Windows Server 2012 R2. Make sure you review the system requirements before installing. Basic configuration – In this video I walk through adding in Active Directory as an application to monitor. I will also walk through adding a service to monitor on a second server. 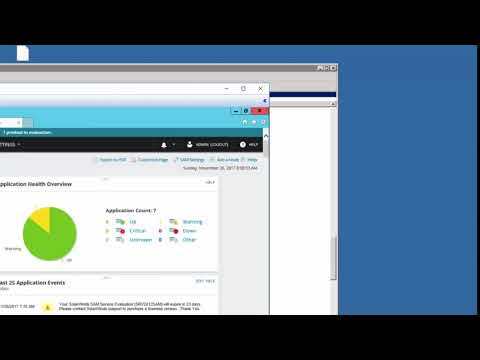 Test Drive – In this video I walk through various dashboards, top 10 lists, view how active directory is monitored, disk space and more. This story is several years old now but it’s a good one. Our IT department has a graphical mapping application that is used by several departments as well as a few outside agencies. The app had been hosted on a physical sever since the beginning of time, it was decided to finally install it on a virtual server. At the same time it was moved to virtual server the mapping software was upgraded to the latest and greatest release. So, when the software was installed on the virtual server it was a different (newer) version than what was on the physical server. When users started to use the app on the new virtual server the complaints started to roll in on how slow it was. Everyone including IT staff (not on the server team) started blaming the virtual server. User#1: I know you moved it to a virtual server and that’s causing it to be slow. User#2: I was told it was moved to a virtual server, it’s now slow can you move it back? User#3: It takes minutes to open since you moved it to a virtual server, why did you do this? IT staff#1 (not on server team): Does the virtual server have the same amount as RAM as the physical server. This all started once it was moved to virtual, it needs more RAM. IT staff#2 (not on server team): Is there a fast enough connection to the server, I think the network needs upgraded. IT staff#3 I think the virtual server needs more RAM. I kid you not these where real comments. What happened next blew my mind. With absolutely no evidence it was the server or network, the departments were in talks of purchasing a $40,000+ new server to put the application on. Then I heard talks of upgrading the network connection which would have been an extra $1,000 a month, again with no evidence it was the network. I was like hello…look at these performance metrics, there is more than enough network throughput to support the application. 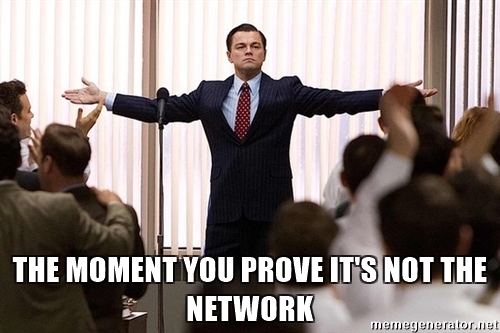 The network is not the issue. It was getting out of control and departments would not listen. Here is how this got resolved. I used SolarWinds to analyze the server and the network performance. I was able to look at the old server vs the new server and compare performance metrics. I found no resource issues with the CPU, memory, disk usage or network links. 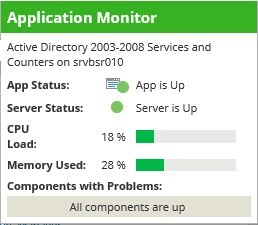 I did find the response times from the SQL server to the app server where high. The servers NIC usage was also higher compared to the old server, which caused the app to load slower for end users. With these reports, we held a conference call with the vendor to go over them and the vendor agreed it may be an issue on their end. Long story short the vendor released some patches that improved the performance of the application. Since the patches there have been no complaints of slowness or performance issues. Having SolarWinds literally saved the company thousands in wasted dollars. This is just one issue where I was able to use SolarWinds and save the company big money. We use so many unique applications and I’ve listened to 3rd party support blame the server or network countless times. In some cases, yes the network or server has been the problem. It makes your job 10x easier to have the tools to quickly identify the root cause of performance issues. It can be very time consuming writing scripts or custom applications to monitor your servers and applications. Investing in a good monitoring system will pay for its self. You can put a STOP to the BLAME GAME. Stop getting blamed by other IT staff or vendors for slow applications, server or network. Try it now, download a free 30 day trial. 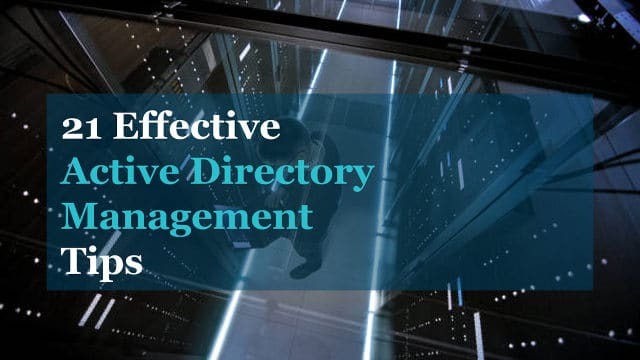 If you didn’t enjoy this review or what to explore other solutions then check out my complete list of Active Directory Management Tools page. Some other companies that provide enterprise level solutions are ManageEngine and Paessler. 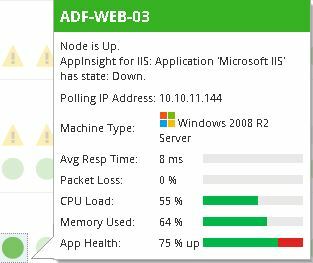 Application & Server monitor is a powerful monitoring solution for critical IT services. When you first implement a feature rich solution such as SAM you may be surprised at how your resources are being utilized. One thing I know for sure is you will be able to resolve issues faster and spot the root cause faster. Hopefully, my video review demonstrated how easy it is to install and configure. This is a solution you can implement today. Try it out for yourself, Download and try the 30 day free trial.